To send Madelinetosh May out with a bang, today we have two Happy Hour specials! 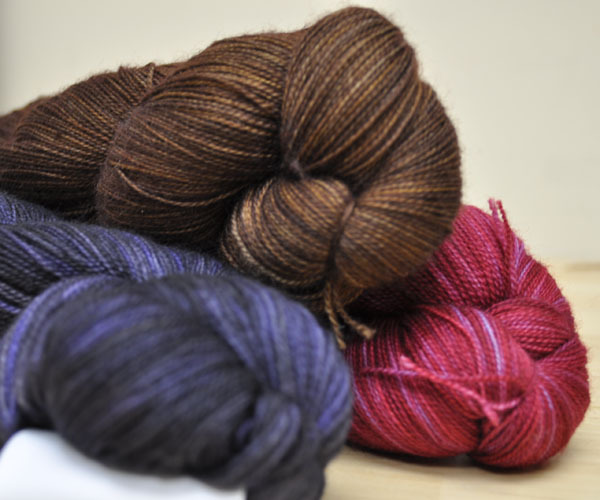 Today’s Happy Hour Specials are: Madelinetosh Tosh Lace and Tosh Sock! Reminder: This Happy Hour promotion runs only between 3 PM – 5 PM Eastern time today, May 31st, 2011. What’s the Happy Hour sale? 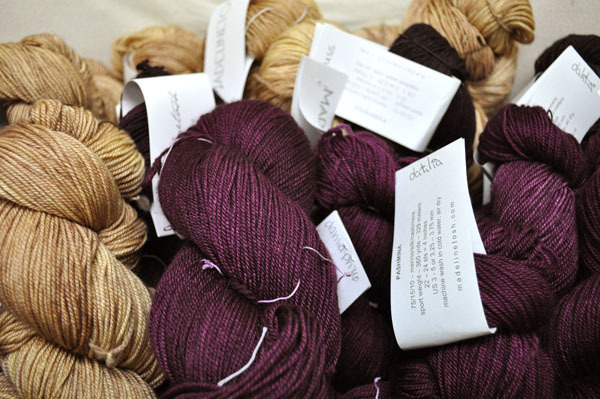 If you missed it the last two week, Eat.Sleep.Knit is mad for Madelinetosh May! For all of the remaining Tuesdays in May, we will be having a Mad May Tuesday Happy Hour sale from 3 PM – 5 PM Eastern. Each week, we’ll choose one of the fabulous Madelinetosh bases to put on sale, and for two hours you can buy as much as you want and get 15% off the selected sale yarn. As an added treat, one lucky Mad May Sale shopper will receive a surprise Mad May gift bag in his or her order – this person will be randomly selected so you never know, it could be you! The fine print: Sale yarn is not returnable; yarn purchased as a part of the sale will not be accepted for return. Due to the volume of orders received during sales, we can not wind yarn or change orders once they have been processed. Today’s Happy Hour Special is: Madelinetosh Pashmina! Reminder: This Happy Hour promotion runs only between 3 PM – 5 PM Eastern time today, May 24th, 2011. What’s the Happy Hour sale? If you missed it last week, Eat.Sleep.Knit is mad for Madelinetosh May! For all of the remaining Tuesdays in May, we will be having a Mad May Tuesday Happy Hour sale from 3 PM – 5 PM Eastern. Each week, we’ll choose one of the fabulous Madelinetosh bases to put on sale, and for two hours you can buy as much as you want and get 15% off the selected sale yarn. Since setting our shipping rates in 2007, postal rates for international shipping from the U.S. have increased four times. No one likes paying for shipping, so we continually made changes to allow us to keep our rates the same even as shipping costs rose. The most recent increases in January were steep, and we knew that we could not continue to absorb the entire rate increase without some changes to our shipping policies. We have always strived to provide all of our customers, regardless of country, with the quickest, most affordable shipping methods and have worked very hard to put together a new shipping rate system that is fair for everyone. First-class – all orders weighing less than 11 oz will be eligible to be shipped via this method. First-Class International – all orders weighing less than 48 oz will be eligible to be shipped via this method. Both international shipping methods will be billed the actual USPS rates for shipping to your country from the USA. Orders subtotaling more than $150 will receive a 50% discount on this rate (the rate you are shown at checkout will include this discount automatically) – basically, we’ll split it with you. A free 12 oz of shipping is also built into the rates of all international orders over $75 as an incentive for orders between $75-$150. For all shipping methods except Express Mail, delivery times are an estimate and not a guarantee. We process and ship nearly all orders within 1 business day (often same day) regardless of mail class. Thanks in advance for your understanding – we will continue to do our best to keep shipping costs as low as possible for every one of you. Eat.Sleep.Knit is mad for Madelinetosh May! Starting today, for the next three Tuesdays, we will be having a Mad May Tuesday Happy Hour sale from 3 PM – 5 PM Eastern. Each week, we’ll choose one of the fabulous Madelinetosh bases to put on sale, and for two hours you can buy as much as you want and get 15% off the selected sale yarn. 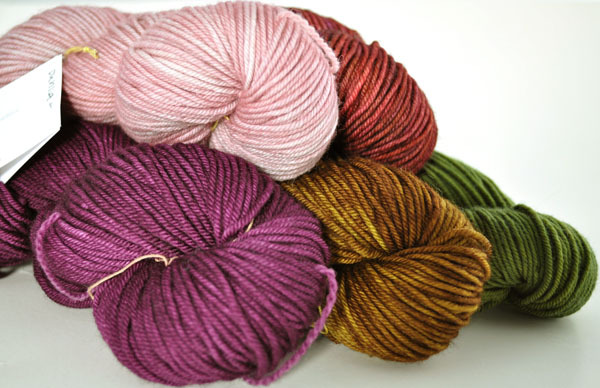 Today’s Happy Hour Special is: Madelinetosh Tosh Vintage! Reminder: This Happy Hour promotion runs only between 3 PM – 5 PM Eastern time today, May 17th, 2011.